A few rain showers will be possible Saturday before a more substantial rain, along with very strong winds Sunday morning. 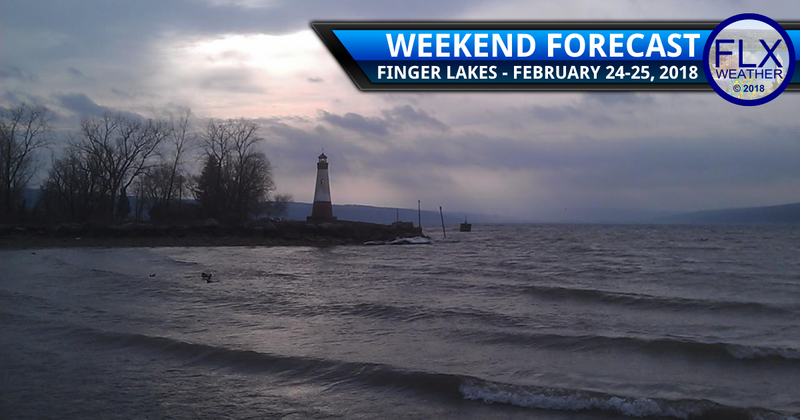 More active weather is on the way for the Finger Lakes through the weekend thanks a stalled out frontal boundary and a couple of areas of low pressure. This front is the same one that moved through on Wednesday, bringing an end to the record warmth across the Finger Lakes. Early Saturday morning, this front was draped from New England, through the Mid-Atlantic and into the Deep South and Southern Plains. 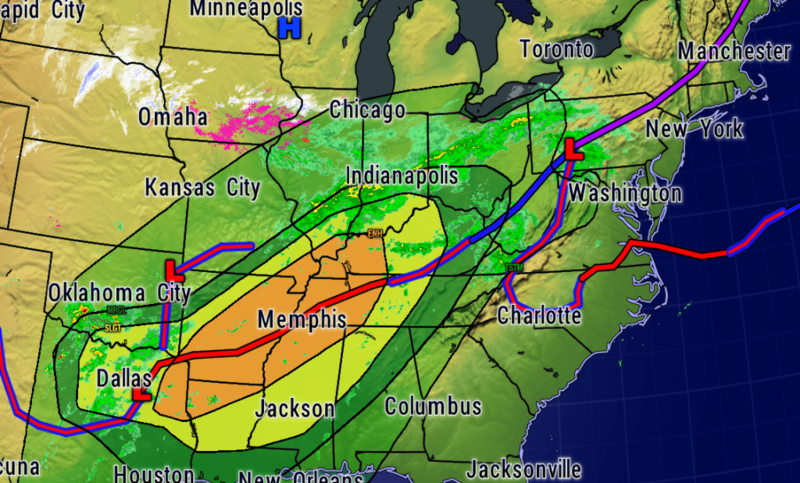 The Saturday morning weather map over the eastern United States is quite busy with multiple storm systems moving along a frontal boundary. Areas in the orange shading from Texas to Kentucky have an enhanced risk for severe thunderstorms Saturday evening, including the potential for large, destructive tornadoes. Click image to enlarge. A small area of low pressure is moving along the front across Pennsylvania while a second system is taking shape over Texas. Rain from the first low extends back across Ohio, Indiana, and Illinois. As the low tracks east, so will this rain. While the heaviest rain will remain south of the area, some occasional showers may work their way into the Finger Lakes, especially for more southern areas. The best chance for these showers seems to be during the afternoon hours. Temperatures will only rise a little today with a high in the low 40s. Late this afternoon and evening, the first severe thunderstorm outbreak of 2018 should unfold across the mid-Mississippi Valley, including the threat for large, destructive tornadoes. Overnight, these thunderstorms will transition into a large area of moderate to heavy rain that will race northeast. Rain should start to move back into the Finger Lakes around or after midnight accompanied by increasing winds. Widespread rain, often heavy, will continue across the Finger Lakes through Sunday morning before tapering off during the middle of the day. Winds will be strongest during the morning hours as well, with frequent gusts of 35-45 mph. Some higher elevations may gust over 50 mph. Thankfully, flooding should not be a major concern in our region. Rain amounts should generally be around three-quarters of an inch, but some localized areas could see over an inch. Temperatures will hold in the upper 30s and low 40s overnight and into the morning before rising to the upper 40s and low 50s for a couple brief hours Sunday afternoon. Once Sunday’s system clears out of the area, a period of quieter weather will settle in for a few days. Sunny skies are currently expected Monday, Tuesday, and Wednesday. Temperatures during this period will remain well above normal with 40s Monday and 50s Tuesday and Wednesday. By Thursday, we will be heading into March. Many other media outlets have already begun hyping early March as a cold, stormy period. In reality, temperatures will be cooler than of late, but will actually be rather close to normal for early March. The models do show another stormy pattern developing. Given that our region just saw several inches of snow 24 hours after temperatures in the 70s and our local history of March storms, there will always be a chance for more storms throughout March. One time period at least the European Ensembles have been locked in on for a number of days now is late next week. The set up remains very uncertain with marginal temperatures, but late Thursday and Friday will need to be watched over the coming days.